Like many of you, I garden and I write about gardening. Both of these are essentially solitary acts. As a blogger, I get to do and say what I am interested in. But I have spent the past few years doing something very different: writing with someone else. It was a process unlike anything I’ve ever done. So I thought I’d share an honest account of that collaboration, revealing both the ups and downs of the process. Our culture holds collaboration as a virtue. Working together toward a common goal is a parable preached by preschools and MBA programs alike. But actually doing it—sitting down with someone and then developing, for example, a 316-page manuscript focused on a marketable idea—is quite another thing altogether. So the celebration of having an accepted book proposal was short-lived. The euphoria quickly melted into doubt. Wondering whether I could pull off a book on my own was worry enough. But seamlessly melding two viewpoints and voices into a single message was something I’ve never done before. Of course, I had a great partner. Claudia’s big ideas and hands-in-the-dirt experience were huge assets. And her passion is contagious. I found myself looking forward to talking to her every week. We logged hours on Skype. I’d fill notebooks with thoughts; mental kindling that set my mind on fire. Plants are social. The layered structure of naturally occurring plant communities was the inspiration for the book. Photo by Claudia West. But starting was hard. One of the beliefs that initially paralyzed us is the idea that you need permission to do anything. In co-writing, civility is certainly a virtue, but politeness can be a waste of time. Clear writing results from a strong point of view and logic; yet our fear of offending the other left us with little resolution on complicated points. We would end long Skype conversations courteously, but without firm resolutions. It left us mushy ground to launch our next week of writing. And it took us many months to get into a rhythm. Initially, we both tried to write pieces of the same chapter. But our styles were so different, the early drafts were a total mess. I was verbose; Claudia was brief. I wrote in paragraphs, feeling my way through arguments as I wrote. Claudia worked from clear outlines that progressively expanded into narrative. I would spend hours polishing a paragraph without knowing what was coming next. Claudia could quickly develop content, but had a hard time expanding this into a narrative. So we changed course. What ultimately worked best was that we’d both hammer out a basic outline. Claudia would free-form several pages of bullet points about a single topic. I would organize them into an argument and rewrite them in a draft form. Then we’d both tweak the drafts. We each had separate roles, but we also each controlled the content at several points. It was an iterative process that allowed us each to shape the idea in the way what we did best. We struggled the most with the big idea. Our first proposal was for a book called Native Planting Design. While there were several regional books on native planting, we wanted to write the definitive resource on designing with natives from an international perspective. But several chapters into that book, we realized that the concept didn’t work. For us, where a plant came from was less useful than how they fit together in communities. So four months before our completed manuscript was due, we scrapped that idea and started over. Throwing away tens of thousands of words was painful. Getting Timber Press to agree to a new angle (and re-vet the book through several layers of approval) was even more painful. But in the end, we all agreed on the new direction. What held us together was a single-minded obsession about the same inspiration: plant communities. The social nature of plants had been almost entirely forgotten by traditional horticulture. Yet I could not even walk down my urban street without being confronted intricately interwoven carpets of weeds. I’d bend over to examine an upright spike of green foxtail, nested in a bed of Indian goosegrass, coming out of a mat of spotted spurge. 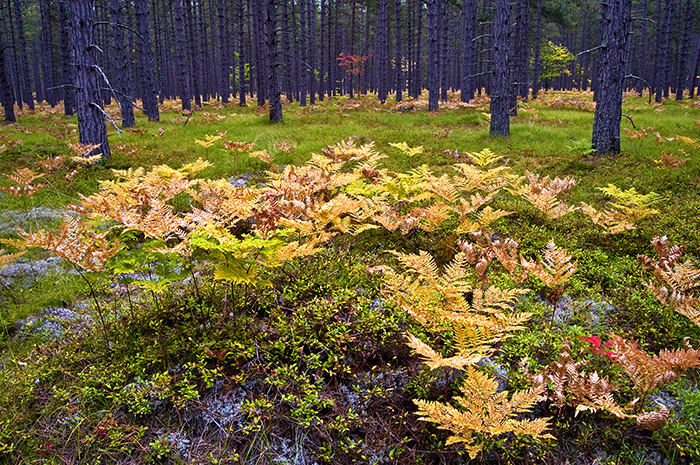 Though the plants were different, the same scene was happening in the native meadow and forest floor. It was so seemingly obvious, so ubiquitous, that writing a book on the subject sometimes felt like proclaiming that the sky was blue or water wet. And yet we came to these inspirations from different points of view. For me, native plant communities were design exemplars, compositional allegories waiting to be explored. My hikes through the grassy balds of the southern Appalachians, or the granite outcrops of Georgia’s monadnocks, or riverside prairies of the Potomac Gorge told a story of patterns and structure. Though the structure is often blurred and the patterns overlapping, the arrangements of plants within these communities are for me a triumph of legibility over chaos. I could not pass a weedy median or walk through an old growth forest without filling my mind with mental notes of new combinations, new matrixes, new X’s and O’s to put together on the next plan. I came to the book wanting to tell the story of design. And to confess to my own ideological bent, I believed deeply in the potential of our native plants, but the lack of good design examples that was holding them back. For Claudia, it was the layering of plant on top of plant—the gorgeous morphological diversity of plants above and below ground—that was the story to tell. Claudia wanted to weave the science of plant interaction and ecological niches (the natural story) together with the history of the German perennial movements (the cultural story). Claudia’s experience in Germany immersed her in the world of Karl Foerster, Richard Hansen, Wolfgang Oehme, Cassian Schmidt, Bernd Hertle, and Norbert Kuhn. Germany’s emergence from the desolation of World War II produced a renaissance of thinking about how perennials could be viable plants for covering much of the country’s public landscapes. Unfortunately, our book only covers a small amount of this fascinating history (Timber Press wanted us to focus on the larger narrative). But hopefully, Claudia will write and speak more about this in the future (her talk this summer on Karl Foerster at PPA in Baltimore was a big hit). In the end, it was the power of the idea—and a trust in each other as colleagues and friends—that got us through the grueling process. That idea was big enough to hold together both our points of view. It’s a big tent idea: I’m confident it will support many, many other expressive variations. Whether the book is a flop or success, the collaboration itself was one of the most rewarding experiences of my professional life. It blew open my thinking about plants, and has set my thinking onto much broader horizons. I am grateful for the experience. Planting in a Post-Wild World is available anywhere books are sold. You can find it online here at Amazon or here at Timber Press.